Lee Loader • View topic - Swam with the Hammerheads Yesterday! Swam with the Hammerheads Yesterday! Re: Swam with the Hammerheads Yesterday! How heavy does that mould throw those hammerheads? 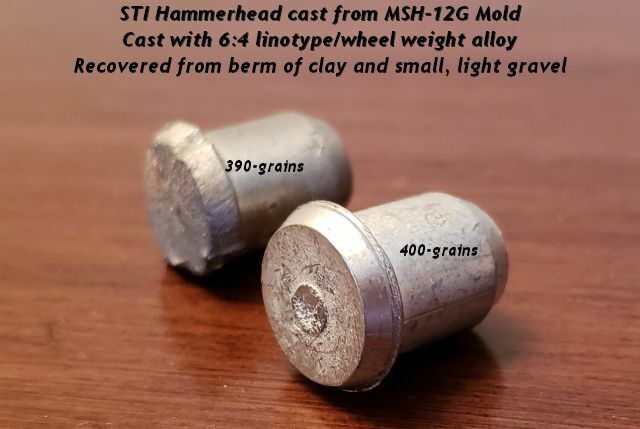 Et2ss wrote: How heavy does that mould throw those hammerheads? The spec is that the total package, sabot and slug, weigh 490-grains. Sabot runs about 77-grains, so about 413-grains for the slug. I know the total is right and will check the weights when I go out to the reloading room. I'm using a 6:4 linotype to wheel weights so my total ejection package is lighter, 472-grains. The slug is tough as nails and I finally recovered one from my clay berm. The sabot is ejected on contact, I find a bunch of them between the target backing and berm. Yeah, that's a hard slug! Looks like they'd bust some bone, no problem. Hardness depends. Those that use shotgun wads tend to be softer so they obitruate to the bore. Sabots, can be anywhere in the spectrum. I used a hard alloy so that they punch on through, the 55 caliber meplat is plenty. You use them for hogs? Et2ss wrote: You use them for hogs? Yes; hogs, whitetails, and nilgai. I had to look up nilgali. Boy those suckers can get huge! They are very good eating. Most of the hunting is done on coastal prairies, but the flooded areas are loaded with slightly higher ground with thick cover. That is really the best country to hunt them in, ranges are very short.